Broadway Building will be developed! Rear elevation stabilization. In 2015, the rear brick chimney separated from the wall, but was stabilized by MPA. A hole in the rear wall where the chimney fell threatened collapse of the whole building. All at the MPA are thrilled to be looking at development opportunities for the Broadway Building. It's been a long road for the Broadway, but it's future is bright after many years of work. Most recently in early June, Oldenburg Construction undertook the monumental task of removing mountains of rotting debris, building materials, and appliances from every floor, corner, and nook and cranny of the building. 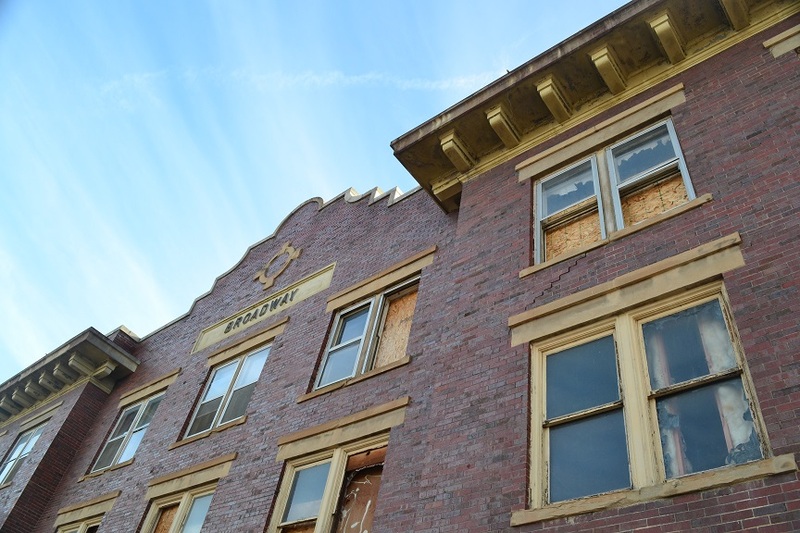 When the dust cleared, the Broadway was featured at a Brownfield Redevelopment workshop in late June, as one of four properties being assisted through an EPA abatement program. From that, we were featured in a Lewistown News Argus story that highlighted our progress on the building. 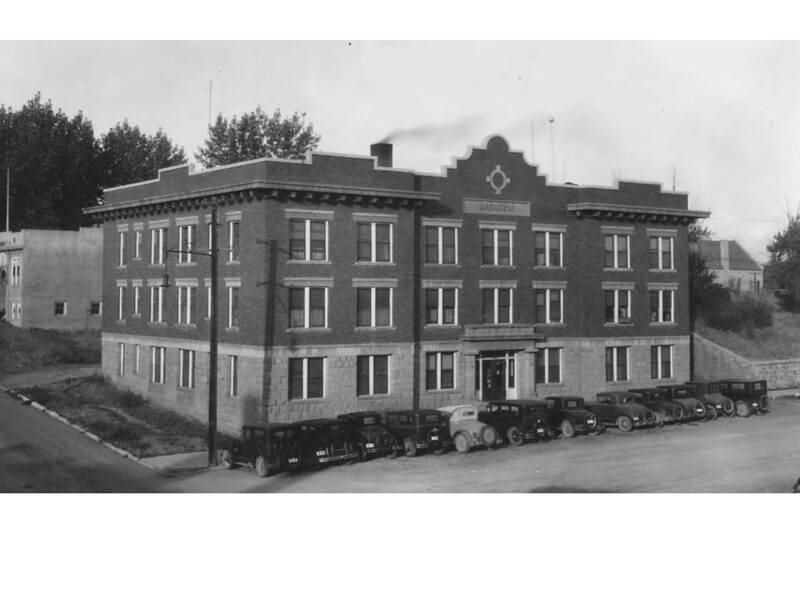 And just this month, MPA gave tours of the Broadway building on Aug. 2 followed by a public presentation about MPA’s historic building redevelopment program at the Lewistown Library. We are excited to see the Broadway reborn and put back into service for the benefit of Lewistown residents and businesses. We will know more on its future early in 2019! A full Preservation Plan and Feasibility Study is available upon request. Contact Chere Jiusto for more details. MPA is making steady progress towards redevelopment of the Broadway Apartments in Lewistown as our skilled teams from Mosaic Architecture, Prairie Wind Architecture, and CTA have finalized their planning, preservation, and economic reports. The reports have defined four pillars that will support this project. · The proposed work has significant support from the Lewistown community. The MPA team is now working on a marketing package that includes incentives to make the building more attractive, such as Historic Preservation Tax Credits, cleanup grants, and more. On the ground, the back yard has been cleaned up and 30 years (and 100 cubic yards) of trash and debris were removed from the site. We thank SAS Sprinklers and Lawn Service for their help during cleanup and generous donation of their equipment to the effort. MPA is ecstatic to report that 2016 saw major progress on the Broadway Building in Lewistown. Significant steps were taken to make the site safer and a better neighbor -- and most importantly -- the collapsed rear wall area was infilled and the building was weatherproofed. In addition, grant funding is in place to have a Preliminary Architectural Report (PAR) produced over the winter. The PAR will examine the best options for developing the building, investigate engineering issues, provide cost estimates, and outline a plan for proper preservation and restoration work. MPA sends a huge thank you to the 1772 Foundation, the National Trust for Historic Preservation, the City of Lewistown Planning Office, and Snowy Mountain Development Corp. for all their guidance and support on this most worthy journey. 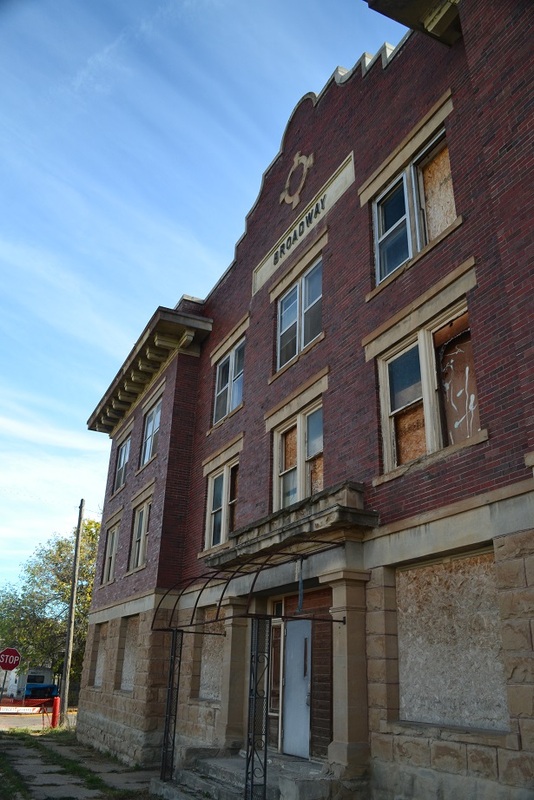 On Friday, October 16 MPA took a dramatic step, and purchased the Broadway Apartments in Lewistown, a building that had been on MPA’s Endangered List since 2001. With a favorable feasibility study in hand, many supporters, and lots of enthusiasm, MPA will make the Broadway a demonstration project for building rehabilitation and put it back into use. A century ago, the Broadway was an upper-middle class apartment building for young professionals and newlyweds, but has been vacant and unmaintained for the last 25 years. In early 2015, a section of its rear wall partially collapsed threatening the entire building’s stability. Lewistown officials called MPA, and after High Plains Architects of Billings determined that the building was still structurally sound, MPA worked closely with the owner, city officials, Duane Ferdinand of the Lewistown Historic Resources Commission, and Lewistown Local Development to come to a purchase agreement. This is the first time in its 28 year history that MPA has acquired a building in order to save it. “We see the Broadway as the first of many buildings that MPA will rescue through a revolving fund model,” said MPA Director, Chere Jiusto. The wheels are already in motion to breathe new life into the building. MPA’s Restoration Director, Matt Morgan is developing renovation plans, and Executive Director Chere Jiusto is raising funds for initial work as we seek a sensitive new owner who will return this local landmark to the proud list of beautiful downtown Lewistown masonry buildings. Stay tuned to the MPA website and our Facebook page for the latest on the Broadway Apartments, and don’t forget to press LIKE when you do!.